A small type of tile, usually between 0.75 inches and 1 inch wide, used to decorate kitchens, bathrooms, and pools. 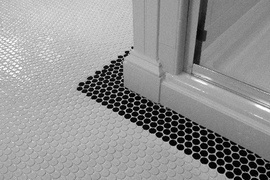 Penny tile comes in round, square, or hex shaped tiles. Porcelain penny tiles sheets cost approximately $5 to $7 per square foot. Cork penny tiles run about $15 per square foot and are water-resistant. Metal penny tiles are the most expensive, costing an average of $65 per square foot.